The Congress on Friday said that the drop in growth rate has been 3 per cent, which means a loss to the country to the extent of Rs. 4 to 4.5 lakh crore. "It's an absolute disaster. 5.7 per cent if you calculate with reference to the criteria under which GDP was earlier calculated, the drop in growth rate has been 3 per cent, which means loss to the country to the extent of Rs. 4 to 4.5 lakh crore. This is a question that has to be asked from this government. Why did they do it?" 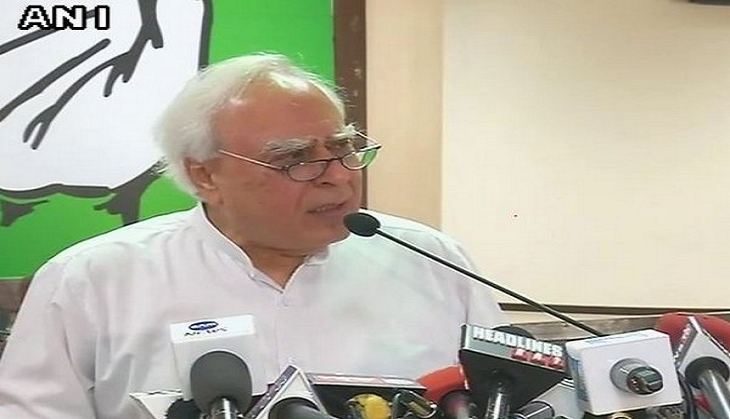 senior Congress leader Kapil Sibal said. He added that this is the biggest scam because all the rich people in this country converted their money. "99.68 per cent of all alleged black money has been converted into alleged white money. The fact of the matter is that the ordinary man has legitimate money in his hand. A majority of people in this country earn Rs. 10,000 a month and that is not black money. Legitimate money was frozen by this government which is the daily bread for poor people. You destroyed the jobs, economy, life of a labourer, construction industry, farmers and small businesses. What did you gain out of it except pain to the people? Why did the Prime Minister allow this to happen? Why did he say that this is a strike against black money when black money is back in the system?" Sibal asserted. India's economy unexpectedly slowed to a three-year low after the Gross Domestic Product (GDP) in the first quarter (Q1) of 2017-18 was estimated at Rs. 31.10 lakh crore, as against Rs. 29.42 lakh crore in the corresponding quarter of 2016-17, thus registering a growth rate of 5.7 per cent. Meanwhile, Quarterly GVA with basic price at constant (2011-2012) prices for Q1 of 2017-18 was estimated at Rs. 29.04 lakh crore, as against Rs. 27.51 lakh crore in Q1 of 2016-17, showing a growth rate of 5.6 per cent, stated an official release published by the Central Statistics Office (CSO). The economic activities which registered growth of over 7 per cent in Q1 of 2017-18 over Q1 of 2016-17 were trade, hotels, transport and communication, public administration, defence, electricity, gas, water supply and other utility services.